I'm sorry, i didn't mean to imply that at all. ): that actually wasn't what I had orginaly wanted to say but, I said it so Evreyone might be on the same page. I apologize. Although I'm disappointed that it turned out to not be real. It makes me happy that the person who did it came out and said so. Have to say I was leaning on it being real. You did a great edit job and put a lot of thought into what you were making, also your voice acting was on point man! And for that I commend you for your creativity, passion and love for Kingdom Hearts! You did a good job! Now let's hope that you may actually be right about that release date. I think the game will come out Winter 2016 anyway! How long do you personally want the main campaign of the game to be? And how long do you think the game will actually be? I would really like for them to come back! I love Drive Forms too! The ones I would most like to return would be Valor Form, as Well as Master Form. I hope we can also get a lot of new Drive forms as well! I've only read bits and pieces of the magna. So I wanted to know is the magna more dark and maybe have more mature things then say the games. Would you like to become a Staff Member here on KH13? I'd like to! Although! I might not be the best im sure I could become good with time. I've always valued this place its special with so many wonderful people who love a common wonderful thing. It deserves to be well kept and maintained! So yes! It would be awesome to me to be a staff memeber. It's kinda like giving back for something that has always helped keep me updated with my one of my favorite things and always helped cheer me up! Sora's Age for Kingdom Hearts III? If you were to go to the kingdom hearts universe. Do you think you would wield a keyblade? If so how how would you obtain it, and what do you think it would look like? What would you use it for? Hashinoto said we would be surprised, what better way to surprise Us by telling us It won't be there and then it appears. Leave us in the dark like last year. Probably not likely not I've just got this feeling. I hope. Square enix are just being trolls like the trailer last year when they said they had nothing to share in the trailer and look what happened. I really want to see master xeahnort too!!!! I know KH3 isn't confirmed for e3 but if it does will it more likely be at sony or microsofts press conference. My bet is on sony since they showed it off last year. But what are the chances for Microsoft, let me know what you guys think. Aink with all if his experience and abbilitys and tools from each game. Sora has all his drive forms, summons, abbilitys at his disposal, vs link who has all of his weapons and magic etc. they have no prep morals are off. It's a fight to the death or KO who wins and why? I want the best featured mechanics of all the games prior to kh3 to be implemented. I want a beautiful soundtrack and music that will make my ears fall off. I want fresh new ideas and gameplay aspects. The graphics to be even more beatiful. I want the seven gurdians of light to be playable. I want to see the characters get a happy ending and fight their respective enemies. And come together to fight master xeahnort.. 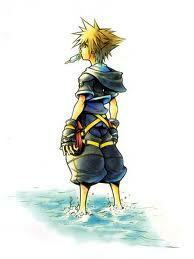 I want sora to have new clothing and I want to see the characters and storyline mature. Such as sora and kari kiss become a couple, roxas and namine. Not gore,profanity no but just a pure maturity and growth for the characters. As long as I get to one on one fight master xeahnort with the x-blade on a mountain in the keyblade graveyard as sora with kingdom hearts above us with a awesome. Final boss theme I will die of happiness. I hope they return but just in a toned down version. So, did anyone else die from excitement when they heard about this? Yes I died and then was resurrected by mickey. However seeing as how I don't have a ps3 im sad. But I hear the ps4 can stream ps3 games through gakai. If that's the case I could have 1.5 and 2.5 and 3 all together on one console I will surley die of happiness after that happens. So hey guys. Watching that new kh3 was so amazing I'm a pumped. But on the topic of flow motion will it still be returning but just without all the glowing stuff. I mean the possibilities just imagine fighting the rock Titan with it. Dogging out of the way with it running up those walls and jumping on top of him to attack him. The gameplay is said to be very flashy so it's possible so what are your thoughts on flow motion/parkour in kingdom hearts 3. My Excitement For KH3 Trailer And 2.5! Haha this was pretty much how I was bro haha. Kingdom hearts fans are the best . When will the trailer be here? Yeah like actually realese it. Not someone who snuck in a phone and recorded it our they actually going to show all of is the trailer. No Kingdom Hearts 3 Trailer until Jump Festa? Please say itit's not so please square don't do that to me. When will they post the kh3 trailer online for everyone to see im dying to see it. And just want to know when they will quench my hype. That trailer better be online soon. Square we waited years for an announcement and now you want us to wait longer. ): the least you can do is show us another trailer.